loving. living. small. | live small with style: GET OUT & GET SOME DESIGN INSPIRATION! You Never Know What Can Inspire You So Keep Those Eyes Open! GET OUT & GET SOME DESIGN INSPIRATION! You Never Know What Can Inspire You So Keep Those Eyes Open! I enjoyed a wonderful weekend here and, of course, had my camera with me ready to go to snap up some inspiration. I took this shot of the exterior of a warehouse in Solana Beach and am super inspired by it. 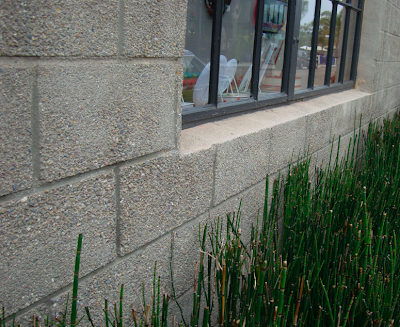 I love the mix of textures - glass, wood, cement, organic plants. There's something about it that inspired me to think about my small space and incorporating and combining interesting textures. If you read LLS, you know how much I encourage getting out and gathering design inspiration for your small space. Your own neighborhood and city will give you tons of ideas. And, most importantly, have fun! Want some more neighborhood inspiration? Click below. 0 Responses to "GET OUT & GET SOME DESIGN INSPIRATION!